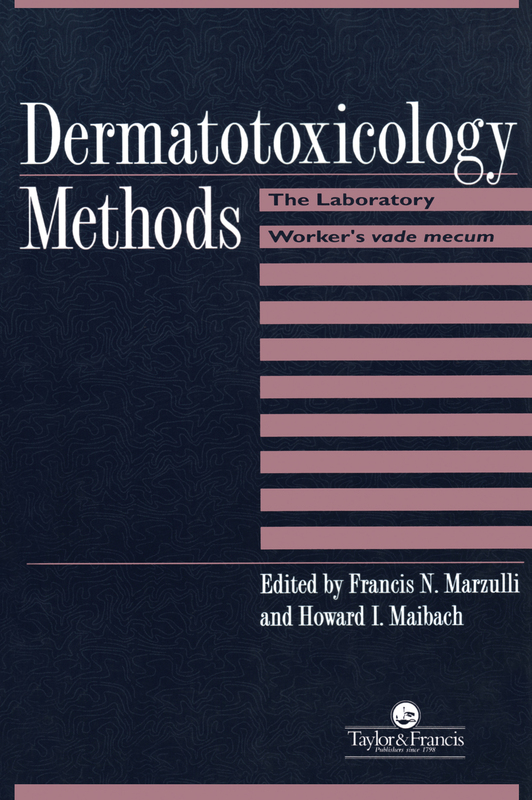 This work presents and evaluates methods employed to identify the potential of certain types of chemicals to adversely affect the skin. A variety of test methods are included such as tests for skin penetration, metabolism, irritation, the skin immune system, photo effects, skin cancer, and topical effects of retinoids and depigmenting chemicals. Tests for chemicals that affect the reproductive and nervous system are also included. Both animal and human tests that have been standardised and tests that are under development and employ animal alternatives are addressed in this book. Besides different testing methods, a rationale for accepting non-animal models and a review of some regulatory agency discussions about animal alternative tests are included. 1. Structure-Activity Relationships in Percutaneous Absorption Jurij J. Hostynek 2. Methods for In Vitro Percutaneous Absorption Robert L. Bronaugh 3. Percutaneous Absorption in Humans Ronald C. Wester and Howard I. Maibach 4. Percutaneous Absorption of Hazardous Substances from Soil and Water Ronald C. Wester and Howard I. Maibach 5. Isolated Perfused Porcine Skin Flap Jim E. Riviere 6. Methods in Physiologically Based Pharmacokinetic Modeling James N. McDougal 7. Methods for In Vitro Metabolism Studies Robert L. Bronaugh 8. Developing a Toxicology Evaluation Plan for Transdermal Delivery Systems Mary E. Prevo, Michel Cormier and James Matriano 9. Animal, Human and In Vitro Test Methods for Predicting Skin Irritation Sunita M. Patil, Esther Patrick and Howard I. Maibach 10. Structure-Activity Relationships in Contrast Sensitisation: Classification and Ranking of Allergens Jurij J. Hostynek 11. Test Methods for Allergic Contact Dermatitis in Animals Georg Klecak 12. The Local Lymph Node Assay Ian Kimber 13. Test Methods for Allergic Contact Dermatitis in Humans Francis N. Marzulli and Howard I. Maibach 14. Contact Urticaria Syndrome Smita Amin, Arto Lahti and Howard I. Maibach 15. Diagnostic Tests in Dermatotoxicology Smita Amin, Antii I. Laurerma and Howard I. Maibach 16. Uses of Cytokines in Dermatotoxicology G. Frank Gerberick, Elizabeth E. Sikorski, Cindy A. Ryan and Laura C. Limardi 17. Characterisation of Epidermal Langerhans Cells Marie Cumberbatch, Rebecca J. Dearman and Ian Kimber 18. Measuring and Quantifying Ultraviolet Radiation Exposures David H. Sliney 19. Animal Models for Phototoxicity Testing Lark A. Lambert, Wayne G. Warner and Andrija Kornhauser 20. Photoirritation (Phototoxicity) Testing in Humans Francis N. Marzulli and Howard I. Maibach 21. The Evaluation of Photoallergic Contact Sensitisers in Humans Kays Kaidbey 22. Chemical Leukoderma (Depigmentation) Howard I. Maibach, Jorge R. Toro, Gerald A. Gellin and Leslie P. McCarty 23. New Models to Assess In Vitro Action of Retinoids Serge Michel and Braham Shroot 24. Sample Protocols for Carcinogenesis and Protocarcinogenesis P. Donald Forbes, Christopher P. Sambuco, George E. Dearlove, Robert M. Partker, Anthony L. Kiorpes and John H. Wedig 25. Testing for Reproductive Hazards from Dermal Exposure Thomas F.X. Collins 26. Quantitative Sensory Testing Gil Yosipovitch and David Yarnitsky 27. Alternative Methods in Dermatotoxicology Mary A. Perkins, Michael K. Robinson and Rosemarie Osborne 28. Skin Equivalents to Measure Phototoxicity Andre Rougier, Catherine Cohen and Roland Roguet 29. A Practical Process for Assesing the Validity of Alternative Methods for Toxicity Testing Leon H. Bruner, Gregory J. Carr, Mark Chamberlain and Rodger D. Curren 30. Update on Agency Initiatives in Alternative Methods Sidney Green Bronaugh, Food and Drug Administration, USA, Leon H. Bruner, Procter and Gamble Technical Centres Limited, UK, Gregory J. Carr, Procter and Gamble Company, USA, Mark Chamberlain, Unilever Research, UK, Catherine Cohen, L'Oreal Research, France, Thomas F.X. Collins, Food and Drug Administration, USA, Michel Cormier, ALZA Corporation, USA, Marie Cumberbatch, Zeneca Central Toxicology Laboratory, UK, Rodger D. Curren, Institute for In Vitro Sciences, USA, George E. Dearlove, Argus Research Laboratories, USA, Rebecca J. Dearman, Zeneca Central Toxicology Laboratory, UK, P. Donald Forbes, Argus Research Laboratories, USA, Gerald A. Gellin, University of California, USA, G. Frank Gerberick, Procter and Gamble Company, USA, Sidney Green, Covance Laboratories Inc., USA, Jurij J. Hostynek, University of California, USA, Kays Kaidbey, IVY Laboratories (KGL Inc.), UK, Ian Kimber, Zeneca Central Toxicology Laboratory, UK, Anthony L. Kiorpes, Redfield Laboratories, USA, Georg Klecak, Department PRPT, Hoffman-La Roche, Ltd, Switzerland, Andrija Kornhauser, Food and Drug Administration, USA, Arto Lahti, University of Oulu, Finland, Lark A. Lambert, Food and Drug Administration, USA, Antti Lauerma, University of Helsinki, Finland, Laura C. Limardi, Procter and Gamble Company, USA, Howard I. Maibach, University of California, USA, Francis N. Marzulli, Consultant in Toxicology, Bethseda, USA, James Matriano, ALZA Corporation, USA, Leslie P. McCarty, Dow Chemical Company, USA, James N. McDougal, Wright Patterson AFB, USA, Serge Michel, Toxicology Consultant, France, Rosemarie Osborne, Procter and Gamble Company, USA, Robert M. Parker, Argus Research Laboratories, USA, Sunita M. Patil, University of California, USA, Esther Patrick, Unilever Research, UK, Mary Perkins, Procter and Gamble Company, USA, Mary Prevo, ALZA Corporation, USA, Jim Riviere, North Carolina State University, USA, Michael Robinson, Procter and Gamble Company, USA, Roland Roguet, L'Oreal Research, France, Andre Rougier, La Roche-Posay Pharmaceuticals Labs, France, Cindy Ryan, Procter and Gamble Company, USA, Christopher Sambuco, Argus Research Laboratories, USA, Braham Shroot, Toxicology Consultant, France, Elizabeth Sikorski, Procter and Gamble Company, USA, David Sliney, US Army Centre for Health Promotion and Preventative Medicine, USA, Jorge Toro, Southern Illinois School of Medicine, USA, Wayne Wamer, Food and Drug Administration, USA, John Wedig, Redfield Laboratories, USA, Ronald Wester, University of California, USA, David Yarnitsky, Tel Aviv University, Israel, Gil Yosipovitch, Rabin Medical Centre, Israel.